Description: Panther, St. Albans, Herts. U.K. 1976. First Paperback Edition, Paperback. Fair/N/A.. 9780586042564 "In this characteristically witty and bitter-sweet book, Kurt Vonnegut Jr. surveys the contemporary scene swooping from space-exploration and the future horrors of spare-parts surgery to the present absurdities of political life. 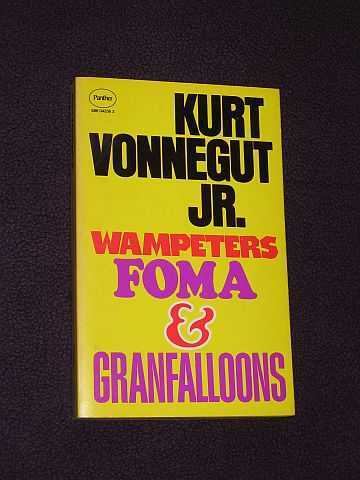 His inimitable clarity of vision, compassionate humanity and unique style make Wampeters Foma and Granfalloons an indispensable reading experience for the ever-growing legions of Vonnegut fans." A tight, as-new copy; 255 pages. Size: 12mo - over 6¾" - 7¾" tall. Quantity Available: 1. Category: Sociology & Culture; Politics; Humour; Anthologies; Essays & Literary Criticism. ISBN: 0586042563. ISBN/EAN: 9780586042564. Pictures of this item not already displayed here available upon request. Inventory No: NOV00012.